Indian bay leaf recipes. tepatta recipes. Bay leaf is a leaf that is used in cooking mostly for its aromatic purpose. Bay leaves can be used fresh or dried for their distinctive taste and flavor. There are different types of bay leaves found and all of them are used in different types of cuisines. Indian bay leaves which are also known as tej patta, are longer and generally have are olive green in color. They are used extensively in Indian Cuisine to flavor curries and subzis but are also used in stews and soups in Mediterranean and American dishes. Bay leaf is an aromatic and hence it enhances the flavor of the food it is added to. Indian bay leaf smells a little like cinnamon but a much milder version of it and is used a lot in the Indian Cuisine. The flavor is so good that is used in so many different types of recipes as well. Shahi Pulao is perfect recipe to express the usefulness of this leaf as it provides a rich, royal aroma to the dish. Just plain boiling the rice with bay leaves gives a much more flavor to the rice for Biryanis. It is also provides a great base flavor to subzis. The usage of tejpatta adds a regal touch to the food it is added to. Punjabi subzis like Bharwan Baingan and Paneer Makhani are blessed with this flavor and would not be the same without this essential. Apart from this, it is also added to tadkas. Tadka is tempering that is added on top of curries and dals to give it more flavor, even the basic ones like Kadhi to the more exotic ones like Panchmel Dal. Bay leaf is also an important ingredient in dry masala powders. Garam masala, probably the most known Indian Collection of spices, uses bay leaf as one of its components along with other whole spices. 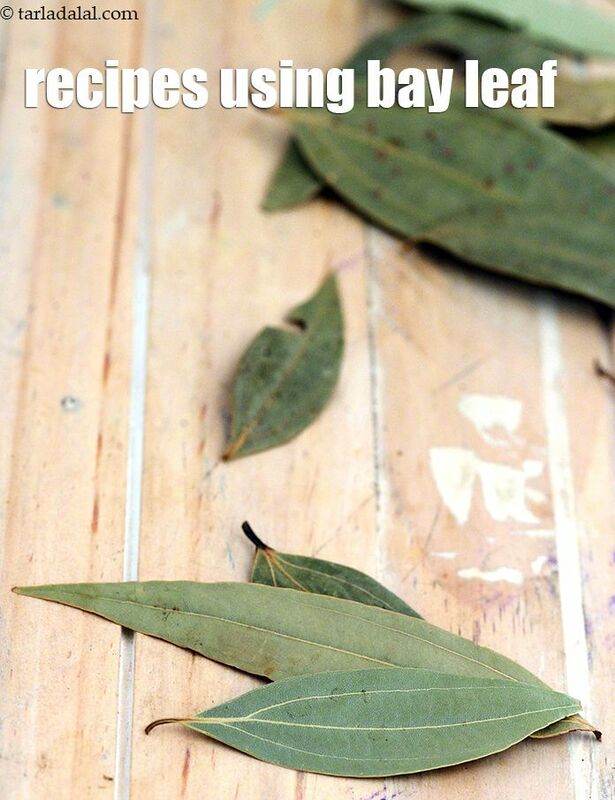 Since it provides such a unique taste to food, bay leaves are considered a boon in the world of cooking. The leaves better the flavor of onions which are then filled in a dough and deep fried to make crispy Pyaaz ki Kachoris. Just the addition of a humble bay leaf to the rich, tangy Tamatar Shorba, will make it smell even more amazing while adding to the taste. Not only is it used in Indian recipes but also used in many international cuisines. Crispy noodles topped with a tomato sauce has a certain earthiness to it because of the bay leaf. It is also used to flavor Italian dishes like the Italian Minestra, a thick soup with pasta and vegetables and innovative recipes like the Curried beans pasta. They are also used in a lot of creole recipes that are famous in Latin America and the Caribbean cuisine as well. Enjoy our collection of Indian bay leaf recipes. tepatta recipes below.